At a time of growing threat of Islamists, German law enforcement officers do not have enough staff to combat radicals, the head of Germany's criminal police told the media. "Of course, we have a shortfall of resources," Holger Münch, the chief of Germany’s Federal Criminal Police Office (BKA) told DPA news agency in aninterview, adding that there currently are 500 ongoing investigations against 800 suspected Islamists in Germany. There are also 300 people on watch lists, which are growing longer. “We are coming to our limits,” the BKA chief said, warning that it’s not possible to have radicals watched 24/7. "In the coming years we will have to redistribute personnel in such a way as to boost our fight with Islamism," Münch said. "We have to prioritize." He admitted that such movement of staff would most probably hurt other police departments. A serious concern for the German police comes from the local Islamists’ links to terrorists in Iraq and Syria. Latest estimates claim over 600 German Islamists went to fight in those countries, and 180 came back. These people are an indirect danger, police say, as they can radicalize local Muslims or even prepare terrorist attacks. According to the police, about 1,000 people in Germany are supporters of Islamic terrorism. Out of those, about 230 could, in future, perpetrate a terror attack in the country. 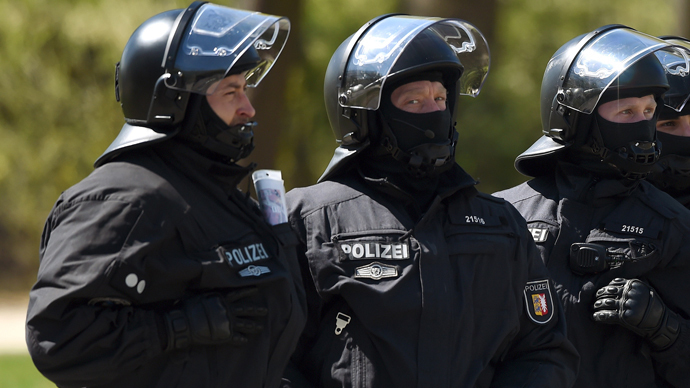 On April 30, police say they have prevented a terror attack at a Frankfurt bike race. They detained a Muslim couple with suspected Salafist militant links. A search of their home turned up detonators and an assault rifle with around 100 rounds. One of two attracted police attention when he bought a large quantity of chemicals used for homemade bombs in a local store, using a false name. "This incident shows that we must all remain very alert," the local Interior Ministry chief told reporters.